When it comes to running a successful business one of the most important elements for small business owners to maintain is contact with their customers. The daily responsibilities a business demands can make this component a difficult one to sustain, but with the right tools, small business owners can connect with their customers while continuing to juggle the many tasks on their plates. 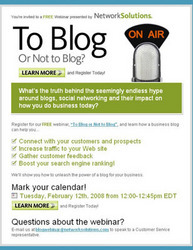 In an effort to help small business owners stay in touch with their customers and increase business, Network Solutions will host a free webinar, “To Blog or Not to Blog,” on Tuesday February 12th at 12:00pm EST. The webinar will be introduced by Kerstin Demko and presented by Jason Shawn, Manager of Web Presence. Last May, Network Solutions hosted this webinar for the first time for existing customers. As a result of overwhelming positive feedback and their continuing commitment to their customers, Network Solutions is now offering this webinar explaining the benefits of blogging. “To Blog or Not to Blog” will highlight topics such as what is a blog, how they are being used, and will offer tips on how to create a blog and effectively integrate it into a small business Web site. Business owners will learn how a business blog can help them connect with customers and prospects, increase Web site traffic, generate and gather customer feedback, and boost search engine ranking. Following the webinar there will be a Q&A session and a recording of the webinar and a transcript of the Q&A session will be available online. Register for this free webinar to learn more about what it takes to create a blog and how to make it work for your business. Currently, Network Solutions includes WordPress blogs in all of its Unix-based Web hosting packages. To learn more about Network Solutions and how its hosting solutions that include free business blogs can boost SEO performance and customer interactions, please visit NetworkSolutions.com. A leading provider of online solutions for small businesses, Network Solutions offers an exhaustive line of products, including E-commerce software, web design, online marketing, domain registration, and other Internet services. With over 28 years in the web services industry, Network Solutions is committed to helping businesses succeed with affordable and simple one-stop shopping solutions. This entry was posted in Which Open Source Blog and tagged Blog, Blogs, Business, Businesses, Create, Impact, Network, Presents, Small, Solutions, Teaching, Webinar on July 31, 2012 by Administrator. LXPortfolio is a Single Page Responsive Template to Introduce Yourself. This template is easy to modify with quality and commented code. Quality code, formatted and comentend to easy costumization. This entry was posted in Which Open Source Blog on July 31, 2012 by Administrator. An Ottawa man who lost his dog to cancer is warning dog owners about the toxic dangers of road salt. Mark Watson, a former IT professional, says that his dog Grover and two other dogs on his street suddenly died of cancer in 2004 likely because of exposure to road salt. A veterinary oncologist suggested to Watson that a toxin in the environment, such as road salt, was likely responsible for the dogs’ cancers because she had seen similar symptoms in several other cases. Watson will also be sharing his story at the Green Living Show in Vancouver at BC Place February 29 to March 2, and in Toronto at Exhibition Place April 25-27. In early 2006, the Sierra Legal Defense Fund and RiverSides Stewardship Alliance initiated a campaign to legislate the reduction of road salt use in Ontario. As per the 2001 Environment Canada report which declared road salt “toxic,” about 4.9 million tons of road salt is released every year on our streets and may poison some birds while being detrimental to wildlife and their habitat. Today, University of Victoria Prof. Harold Foster stands by the initial study and continues to state that we are spreading toxic road salt on our streets at our peril. He hopes to see further studies done. After losing his dog Grover to cancer, Watson searched the globe for natural alternatives to toxic road salts and ice melters. “My searches took me further and further around the world and eventually I came across a green volcanic mineral that has amazing traction properties and is 100% safe for pets, property and the environment,” explains Watson. He says that his product is not only safe but he claims that it even helps to absorb toxins and heavy metals from the environment. “Some municipalities use this mineral to filter their drinking water as well as to clean up chemical spills,” says Watson. He explains that in the Spring and Summer, EcoTraction becomes a mineral nutrient for the lawn and garden instead of destroying vegetation like road salt does. He also says that it is used by organic farmers as a natural soil amendment and as a safe food additive for cattle and chicken. “Millions of dog owners are concerned about their pets’ health and EcoTraction is the safest and most effective solution to address their needs,” says Appleby. This entry was posted in Which Open Source Blog and tagged Being, Owners, Road, Salt, Toxicity, Warned on July 31, 2012 by Administrator. JumpBox, Inc. (http://www.jumpbox.com), an innovative provider of virtual appliances that greatly simplify server software deployment, today announced that they have grown their library of JumpBoxes based around Open Source software to include six additional applications: Cacti network graphing system, phpBB discussion forums, ProjectPier project management system, TikiWiki content management system, PmWiki wiki software, and MoinMoin wiki software. These additions bring the total number of applications in the JumpBox production library to twenty. JumpBoxes are time-saving virtual machines that enable open source applications to be deployed faster and easier than ever before. Deployment requires minimal technical skill from the user, and theJumpBox Runtime system provides ease of use features like automated backups and a consistent web based control panel for common system functions. JumpBoxes make things simple by bundling a complete application stack into a turn-key, pre-configured unit that runs on top of virtualization software such as VMWare, Xen Open Source, Parallels, Virtual Iron, and Microsoft Virtualization. The JumpBox production library already contains virtual appliances for other popular Open Source applications, including: Alfresco, Bugzilla, DokuWiki, Drupal, Joomla!, Mantis, MediaWiki, OTRS, PunBB, TWiki, Trac/Subversion, vTiger CRM and WordPress. All brands, product names, company names, trademarks and service marks are the properties of their respective owners. All rights reserved. This entry was posted in Which Open Source Blog and tagged 20th, Appliance, JumpBox, Production, Ships, Virtual on July 31, 2012 by Administrator. Do you need to promote your product or service? Sevilla Landing Page is the best solution for your business. Easy to edit, with super clean code, this landing page can be use for multiple purposes. The template comes well organized, with HTML , JS and CSS files. With this template, you will be able to increase your sales and promote your product with style. 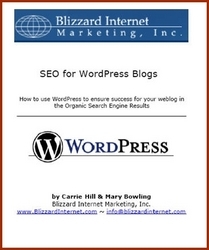 SEO For WordPress Blogs – a Free White Paper from Blizzard Internet Marketing, Inc.
Blizzard Internet Marketing, Inc. is proud to announce the release of their latest free marketing whitepaper, “SEO for WordPress Blogs” by their in-house Search Engine Optimization team, Carrie Hill and Mary Bowling. Learn why Blizzard Internet Marketing advocates using one of the best platforms for building an SEO friendly website, and how to set your own website up for success. Blogging is the wave of the future, but not all blog platforms are built alike. While there are many options to choose from, if one wants their blog to be user and search engine-friendly, WordPress should be a first choice. The white paper will tell why and explain how to use it to perform better in the Google Search Engine Results Pages (SERPs). This entry was posted in Which Open Source Blog and tagged Blizzard, Blogs, Free, from, Inc., Internet, Marketing, Paper, White, WordPress on July 31, 2012 by Administrator. eApps Hosting announced the immediate availability of new virtual private server (VPS) hosting plans using the CentOS 5 operating system and offering up-to-date versions of all application services. The eApps VPS Hosting plans now run on CentOS 5.1, the latest version of the popular enterprise-grade Linux operating system. CentOS 5.1 includes the Apache 2.2 web server, which offers many new features over the prior version. Furthermore, the new hosting plans have been built with a repository-based application delivery system which makes it easy for Java, PHP, and Ruby on Rails developers to take advantage of the latest versions of their programming environment, database servers and related applications. The eApps application repository contains up-to-date versions of Java, Tomcat, JBoss, PHP, Ruby on Rails, MySQL, PostgreSQL, WordPress, graphics libraries, mail services, Joomla!, Drupal, streaming media servers, and many other applications. All applications included in the eApps Application Repository may be installed with a single click, are kept up-to-date and are covered by a 24/7 phone and email support program. 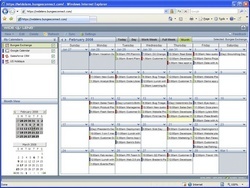 For additional information contact eApps Hosting at +1-770-448-2100 USA or +44 (0)20 8133 6940 UK or sales@eapps.com or visit http://www.eapps.com. More information on the new plans and eApps Hosting Application Repository can be found at http://www.eapps.com/plans. eApps Hosting is a high value provider of managed hosting and related services for businesses and organizations, serving more than 4,500 customers in over 130 countries. eApps Hosting offers a state of the art hosting platform, using Virtuozzo Virtual Private Server technology by Parallels, for commercial-grade web sites and applications along with highly personalized, responsive 24/7 service. CentOS 5.1 is a product of CentOS.org, the Community ENTerprise Operating System. Virtuozzo is a product of Parallels. This entry was posted in Which Open Source Blog and tagged Applications, CentOS, Hosting, Including, Latest, Plans, Using, Versions on July 31, 2012 by Administrator. A “moonLight Coming Soon page” is perfect if you like a clean and minimalistic design. The pack allows you to use 3 different type of pages, one clean and simple, with timer option and gallery. Both pages have a set of social icons so your visitors can follow all your updates. The page is Search Engine Optimized using professional html markup, and you can connect to twitter to have your page always updated. In the footer there is a module show the last post done on twitter. This week sees the official launch of 34SP.com’s automated script installers. These new installers take advantage of 34SP.com’s robust UK hosting plans, providing instant access to advanced applications. He continued, “There are plenty of applications out there, and most of them aren’t fun to deal with. We aim to take as much pain out of the process as possible. We want our customers running their sites, not pulling their hair out in frustrating installation procedures. About 34SP.com: Founded in the year 2000, 34SP.com was established with the aim of bridging the gap between sophisticated hosting solutions and affordable prices. 34SP.com has become synonymous with content management focused UK hosting, reliability, professionalism and value for money. The company is headquartered in central Manchester, England. 34SP.com is a registered trademark of 34SP.com, Manchester, England. All other product or company names are used for information or identification purposes only and may be trademarks of their respective owners. This entry was posted in Which Open Source Blog and tagged 34SP.com, Hosting, Pain, Script, Takes on July 31, 2012 by Administrator.